...it's worth checking the bushings at the end of the struts, and if they're worn down Prothane's strut rod bushings are a long-lasting, durable replacement. Polyurethane Front Strut Rod Bushings hold the caster angle of your wheels much better than the flexible original bushings, preventing wheel hop and maintaining steering axis. 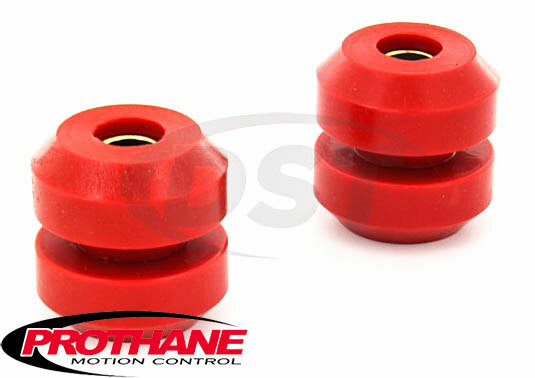 Check out Prothane's strut rod bushings for your vehicle below. The original bushings on the arm that stabilizes the struts are made of rubber and are succeptable to wear, motor chemicals, and road grime. Since the struts control the caster angle of the wheels if they have an insecure connection caused by a loose strut arm you could experience steering problems especially during quick acceleration. Prothane's strut rod bushings are made with polyurethane and keep their shape much longer than rubber when exposed to the stress of travel. Polyurethane provides a cushion but also keeps the strut arm secure, meaning the axis of the front wheels that helps determine steering direction is consistent. Wheel hop, or rapid gain and loss of traction, is also a symptom of worn strut rod bushings in front wheel drive vehicles that can be eliminated by poly bushings. If you notice steering wobble when you take off from a dead stop it's worth checking the bushings at the end of the struts, and if they're worn down Prothane's strut rod bushings are a long-lasting, durable replacement.